The title is drawn from Pac Man, an arcade came that first came out in 1980. In one of the world’s first video games, the player guides Pac Man, a small faceless mouth, through a maze while he devours Pac Dots and tries to escape blob monsters. The first three minutes of END:CIV superimpose a Pac Man game over images of old growth clear cuts, belching smokestacks, factory hog farms, wild fires, hurricanes and the US military’s ruthless killing machine. The sequence ends as a gigantic “GAME OVER” flashes across the screen. The film is based on the Endgame, the best selling two volume book Derrick Jensen published in 2006. 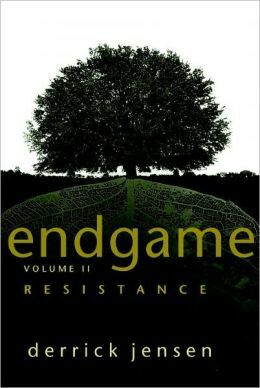 In Endgame, Jensen argues that mankind urgently needs to bring down “civilization” before it destroys the planet. He bases his case on twenty basic premises he lists at the beginning of both volumes. The film END:CIV examines four of them. Premise 1 – industrialized civilization has never been and will never be sustainable, mainly because it’s based on non-renewable resources. The film, like Jensen’s book, traces the rise of cities, which by necessity steal resources from distant regions and eventually denude the entire landscape of those resources. After making the case that the corporate elite are mindlessly and voraciously consuming an ever increasing amount of energy, land, water and other resources, the filmmaker reminds us that we live on a finite planet. He then argues that corporations will most likely continue this greedy consumption until everything is used up – or until we stop them. Premise 2 – A major focus of industrialized civilization has been to destroy indigenous communities by force – because they don’t willingly allow the confiscation of their natural and mineral resources. A corollary of Premise 2 is that without its heavy reliance on violence, industrial civilization would collapse. In an cameo from a public forum, Jensen explains that much of violence is invisible and a matter of conditioning. He gives the example of the cop who will pull a gun and drag you to jail if you don’t pay your rent or satisfy your hunger by eating off grocery shelves. Yet we are all indoctrinated to believe that people must pay for the right to exist on this planet. The film goes on to criticize the main message put out by the nonprofit environmental movement: that people can remedy pervasive violence, resource theft and exploitation by making politically correct purchases. In the view of Jensen and other activists featured in the film, Greenpeace, Sierra Club, Forest Ethics and similar “eco-bureaucracies” have essentially sold out by making preservation of the global economy more important than saving the planet. This section is also highly critical of the dogmatic opposition of the environmental movement towards violent resistance. Jensen does a great send up of the movie Star Wars. In his version, the rebels don’t destroy Darth Vader by blowing up the death star. Instead they promote eco-tours and Fair Trade products from endangered planets and send waves of compassion and loving kindness towards Darth Vader, while locking themselves down on his ship. They also vote to condemn and exclude the renegades who propose to blow up the death star – for allowing themselves to be contaminated by Darth Vader’s culture of violence. Premise 3 – the culture (of industrialized society) as a whole and most of its inhabitants are insane. The section points out that, contrary to popular belief, no combination of fossil or alternative fuels will allow us to continue our current “happy motoring” society. It focuses on Alberta’s insane tar sands project, the most environmentally destructive enterprise in history. Premise 4 – from the beginning, the culture of civilization has been a culture of occupation.